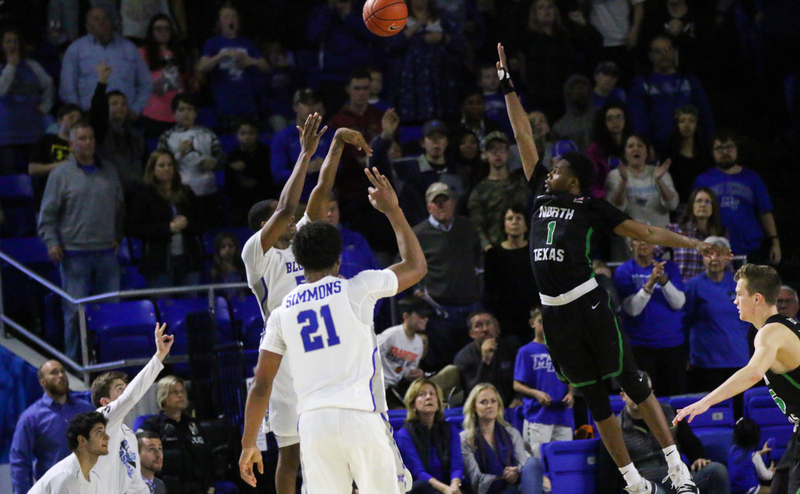 The North Texas Mean Green (14-11, 7-5) gave the Middle Tennessee Blue Raiders (20-5, 12-1) all they could handle on Saturday. The Mean Green benefited from sophomore guard Roosevelt Smart’s monster night, as he made seemingly everything in a 32-point effort. 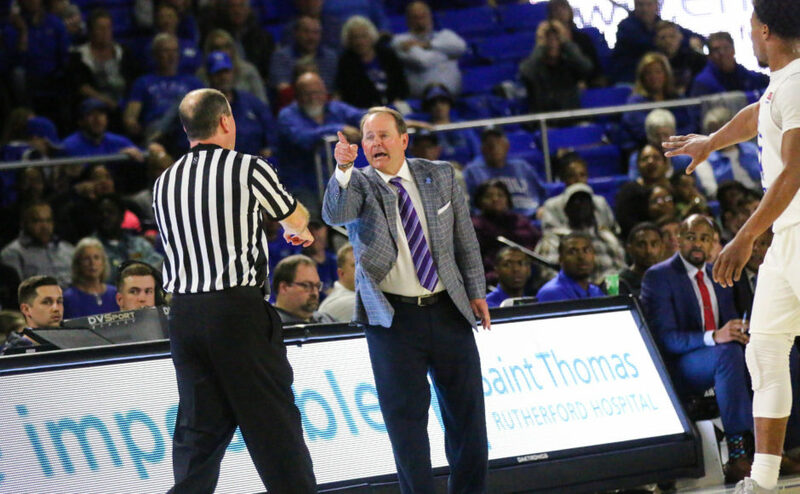 It wasn’t enough, however, as the Blue Raiders won by a final score of 79-73. 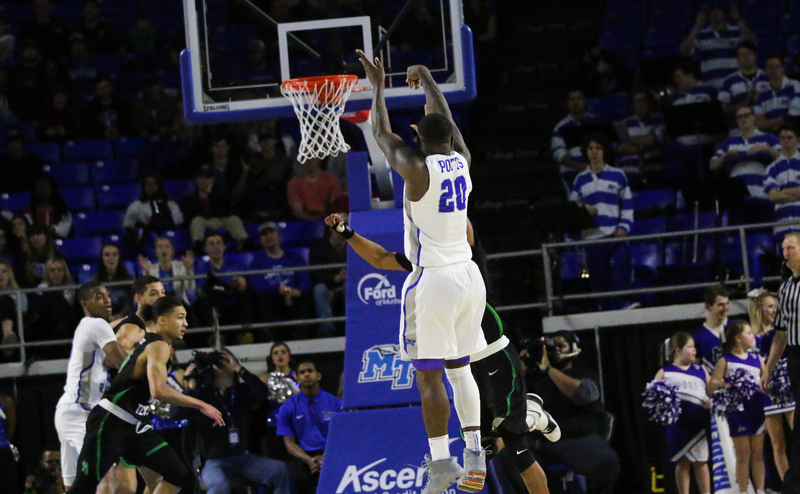 Senior Nick King scored buckets early and often for MTSU, as he recorded the team’s first nine points. The Mean Green responded as Smart connected on his first of seven three-pointers on the evening, effectively waking up the North Texas offense. Middle led throughout the entire first half thanks to one of their best shooting halves of the season. 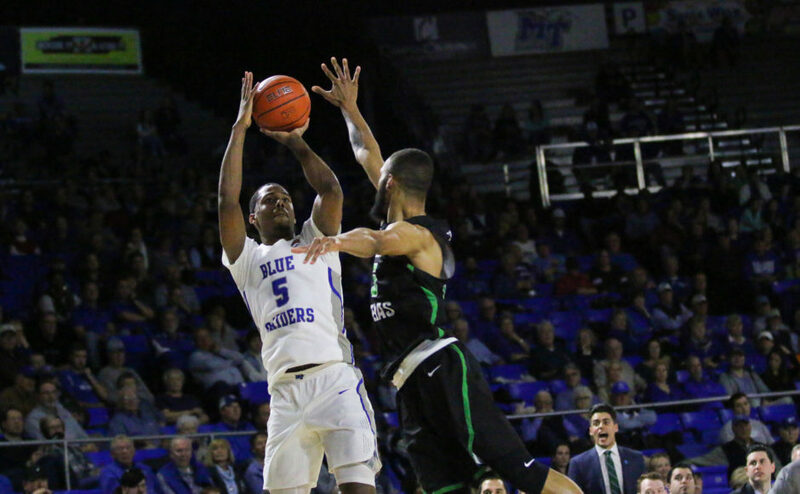 The Blue Raiders shot 51 percent from the field and 54 percent from beyond the arc. North Texas was a little better, however, shooting at a 55 percent clip in the first half. The Mean Green offensive firepower was enough to cut their deficit to five, as they went to the locker room trailing by a score of 45-40. Things got more interesting in the second half as North Texas opened on a 9-2 run, capped by another Smart three-pointer in the right corner despite being heavily guarded by senior guard Giddy Potts. 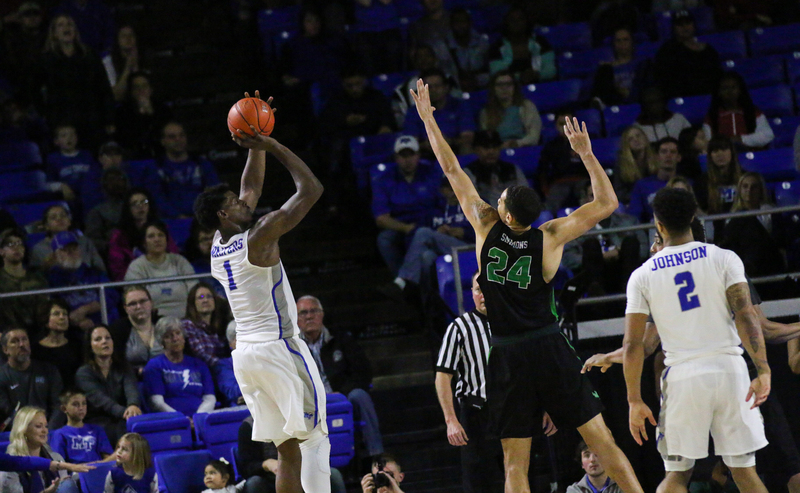 The Blue Raiders responded with an Antwain Johnson mid-range jumper to tie the game. 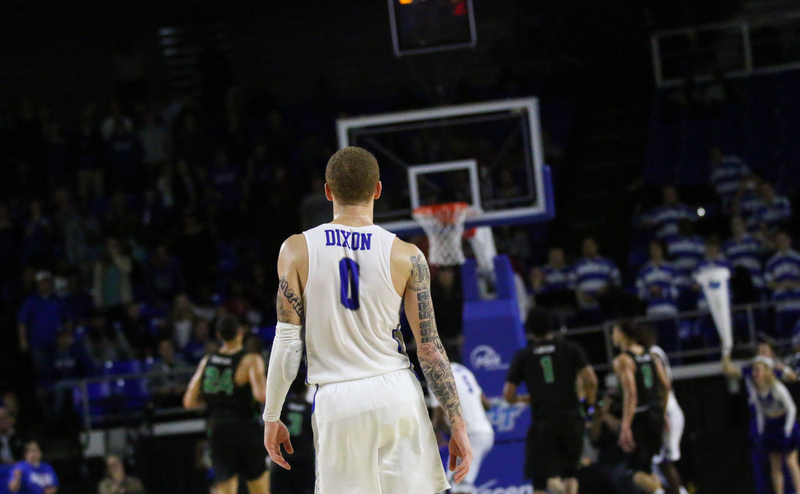 Sophomore point guard Tyrik Dixon found Potts in transition for a lay-up to give Middle Tennessee the lead only moments after being down two points. The game saw both teams exchanging blows, and each struggled to get a comfortable lead. North Texas found a way to tie the game as late as the 5:40 mark when Jorden Duffy knocked down his only three-pointer of the night to tie the score at 69. Like he did earlier in the game, Johnson responded by matching Duffy’s three with one of his own. Despite all of the tough shots Smart hit in the game, his mistake with 2:19 left in the game sealed the Mean Green’s fate. With no timeouts remaining, Smart dove on a loose ball and attempted to call a timeout, resulting in a technical foul. 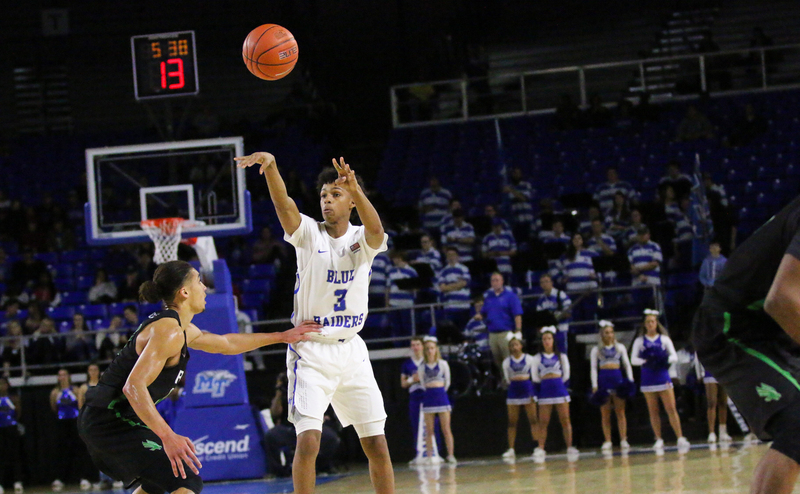 Potts calmly sank the technical free throw to give MTSU a five-point cushion. The home team made their free throws down the stretch, and completed a couple strong defensive possessions to survive the scare from one of the conference’s up-and-coming programs by a score of 79-73. As he has done countless times this season, King took over and put the team’s offensive production on his back. On Saturday night, King tied the record for the most 30-point games in a career by putting up 32 points on 11-21 shooting. Though he dominated on offense, he was quick to compliment his teammates following the game. Being the top team in the conference comes with the notion that every team will give you their best effort. On Saturday night, that was the case with North Texas. The Mean Green shot over 54 percent from the field. 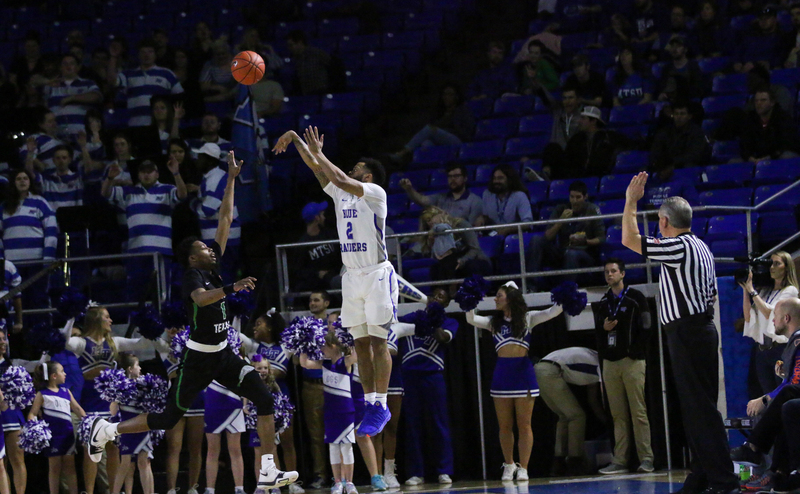 Also, with Smart’s 32 points, the Blue Raiders never gained a comfortable advantage. As one of the more improved teams in C-USA, North Texas proved their worth against the conference’s best team. 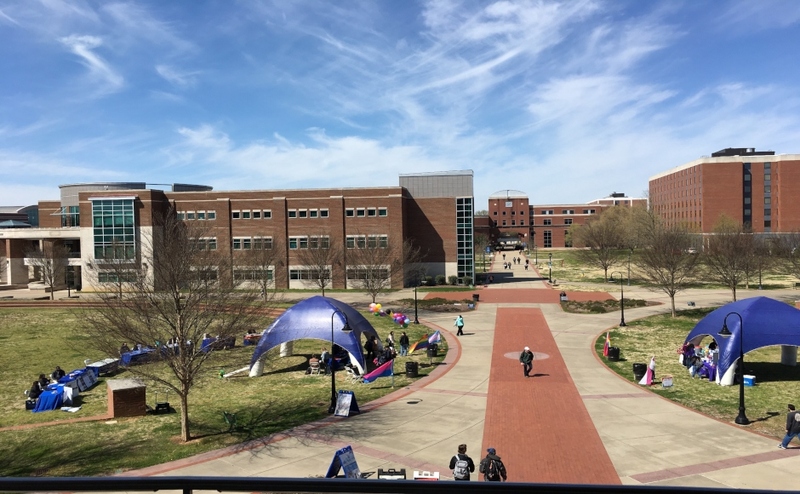 At the same time, the Blue Raiders showed that they can handle adversity and win games, even when their opponents play at their absolute best. 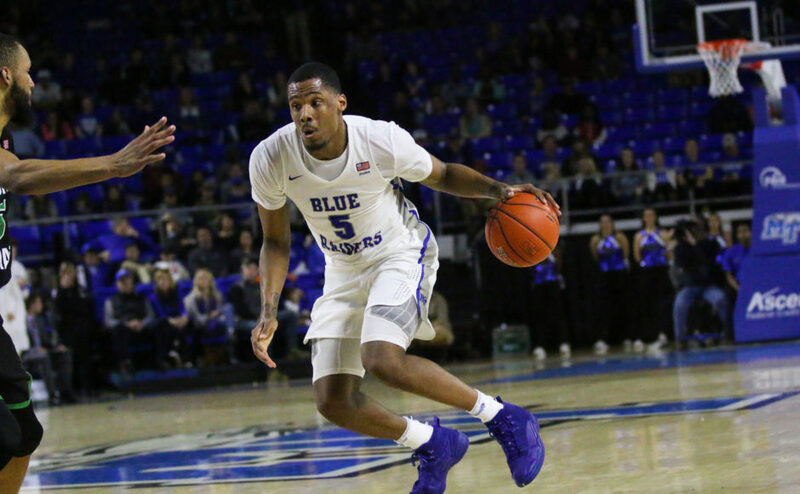 The Blue Raiders will head down to Hattiesburg, Mississippi to take on Southern Mississippi on Thursday night at 7 p.m. MTSU won their first meeting against the Golden Eagles at home by a score of 69-49.